The Story Behind My Logo! Well, many years ago, back in England, I was at a pub quiz with my then boyfriend and a whole bunch of friends. Apparently my artistic streak was fighting to get out that night, and inbetween questions, I was doodling on beer mats. Until I ran out of beer mats. I was looking for something else to draw on, and my boyfriend just gave me his arm to shut me up. I drew this symbol on his wrist. I had been using it for many years as a kind of signature on my art work and letters, (remember snail mail??) it is a combination of my initials, SS, with devil horns and tail, and a halo, going along with the whole Original Sin theme. Well, I doodled it in biro on my boyfriend’s wrist, and I thought it looked awesome there… so less than a week later, I went and got it tattooed on myself! I still use it on all my paintings, drawings, letters, etc, and have recently started to use it on the packaging for my Etsy sales. I love it. To me, tattoos should be meaningful, and this one means even more to me now than it did when I first got it, 17 years ago. I know it is not the best tattoo ever, back when I got it, we had a choice of one tattoo shop in my home town, and I didn't know any better... But I still love it, and it makes me happy to see it every day. 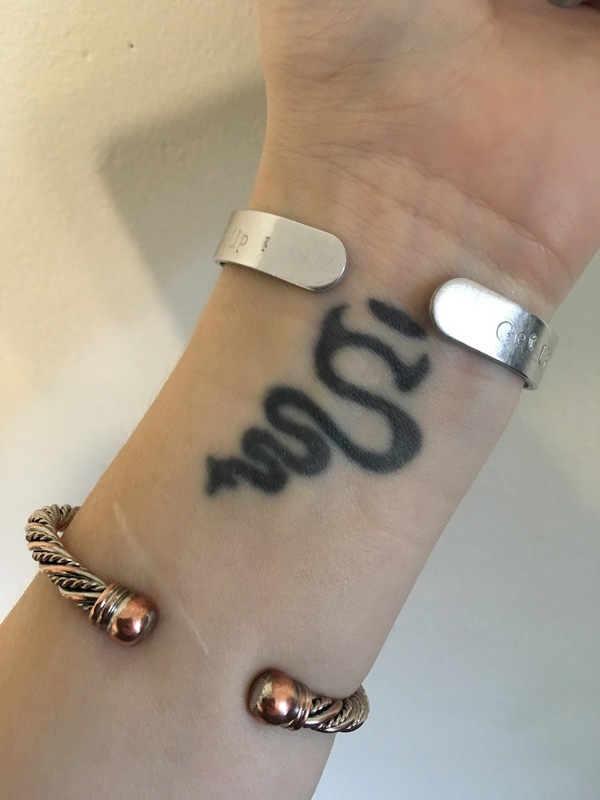 Do you have any cool tattoo stories you'd like to share? Message me below! Reasons why you should sign up for my VIP Email list! Please excuse my nervousness and constant note-reading. I am still terrified of cameras! Yes, it is Mother's Day in the UK, and since that is where my Mum is, this is the day we celebrate. I sent her a nice vase of flowers, but sometimes it's really hard to be so far away from my family and friends back home. 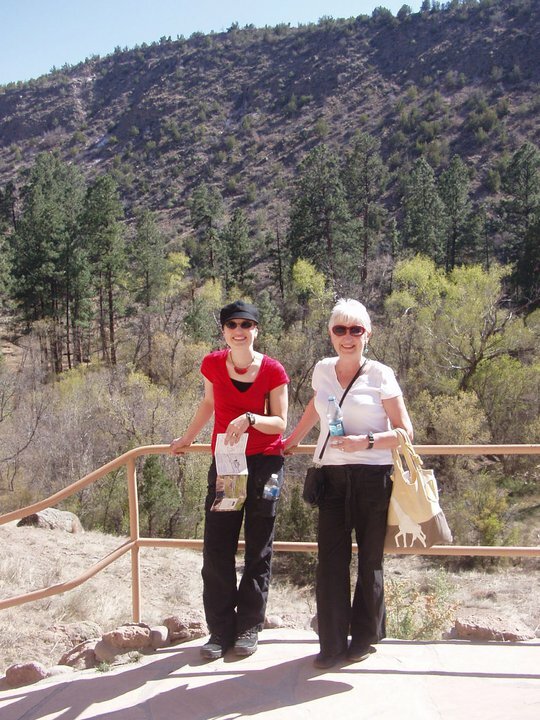 This is my favourite photo of both of us, taken in Bandolier National Park, NM. We didn't realise it at the time, but were both standing in the exact same pose! I've always been told that I look like my Mum, but that was the first time we realised there are even more similarities between us! I get my height, looks, perseverance and organizational skills from her, as well as a strong set of morals. Even though we are so far apart, it is comforting to know that she will always be there for me. Hi everyone! I want to thank each and every one of you for following me, and for all your continued support. Now I need some help from you all, please! 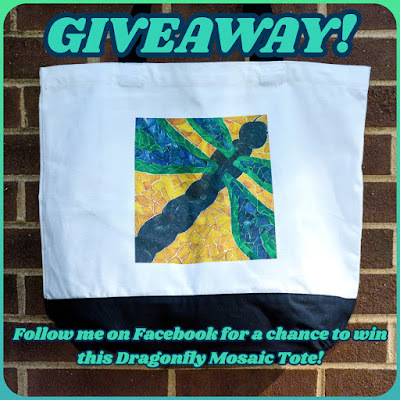 My Facebook page, is sadly lacking in followers compared to my Instagram… So to remedy that, I am going to give away one of my fabulous new cotton tote bags, printed with my OriginalSinArt Dragonfly Mosaic painting, worth $25.00! The bag is 100% cotton, 18 in X 15 in, and machine washable! 2. Comment on the post pinned to the top of my Facebook page, telling me who your favourite artist is. 3. For extra entries, share this post on Facebook! Each share is an additional entry. The winner will be picked with the help of a random number generator at 3pm EST on March 18th 2018. Good luck! In the event that I am unable to reach the winner via Messenger within 24 hours, I will randomly pick another winner, and so on. This Giveaway is in no way sponsored or endorsed by Instagram or Facebook.